Kiwi Property is pleased to advise that the seismic strengthening works at The Majestic Centre tower have completed, with new lease agreements highlighting the strength of tenant demand for buildings rated ‘low risk’ for seismic performance. Chris Gudgeon, Chief Executive, said: “This has been one of the most complex seismic strengthening programmes ever undertaken in New Zealand, with our programme of works undertaken in stages over a 4.5-year period to keep the building operational throughout. “From the outset, we received strong support from our tenants and, since works began, we have undertaken leasing deals equivalent to 93% of the building’s office area. As a result, the building has a weighted average lease term of 6.7 years – which shows tremendous support for the outcomes we have been able to achieve at The Majestic Centre,” said Mr Gudgeon. The project reached practical completion on 31 January 2017, with the tower now achieving a performance-rating equivalent to 100% of New Building Standards (NBS). “Since the Canterbury earthquakes in 2010 and 2011, and the subsequent Wellington and Kaikoura earthquakes, we have witnessed a surge in tenant demand for buildings that are highly rated for seismic performance,” said Mr Gudgeon. The Earthquake Commission has been a long-standing tenant within The Majestic Centre and recommitted to a new lease in the building during the seismic upgrade project. Hugh Cowan, General Manager Reinsurance, Research and Education, Earthquake Commission, said: “Since the Canterbury earthquakes, Kiwi Property has displayed integrity and leadership in understanding earthquake building risk and overcoming the technical challenges to reduce it. They proactively engaged everyone in the building – openly sharing their understanding of the situation and what they planned to do to fix it. Michael Holloway, GM Commercial, said: “We have been fielding increasing tenant inquiry from Wellington office tenants who recognise the strength of the tower and the quality of the building. “Today, we are pleased to announce that we have secured a further tenancy agreement for a new nine-year lease over 1,021 sqm of space, commencing in May 2017,” Mr Holloway said, noting that seismic performance was a strong motivator for the new tenant to move to The Majestic Centre. Kiwi Property also recently reached agreement with Summerset Group Holdings Limited for a new 12-year lease to accommodate their growth requirements, increasing their premises by 782 sqm to 1,803 sqm progressively from April 2017. 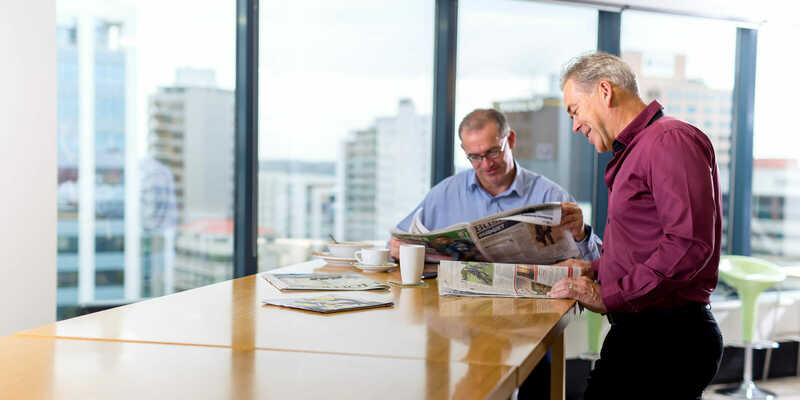 One of Wellington’s most recognisable office towers, The Majestic Centre offers 21 levels of A-grade office accommodation for high-quality tenants from the public and private sectors. Kiwi Property’s market leading commitment to strengthening works has resulted in the building now being recognised as one of the most attractive office accommodation options for tenants in the Wellington market. Providing context to the scale of the strengthening works involved, Kiwi Property’s contractor Fletcher Building poured 1,300 cubic metres of concrete, installed 1,325 tonnes of structural steel, laid 53.2 kilometres of post-tensioning strand and inserted 53,500 bolts and anchors. During the project’s peak construction period, construction crews worked in two shifts covering 21 hours a day, seven days a week. The strengthening project has cost in excess of $83 million. In 2013, while the seismic upgrade was in progress, earthquakes in Cook Strait produced moderate shaking in Wellington, which was recorded on a GeoNet array of sensors installed in The Majestic Centre for research purposes several years earlier. The measurements of the shaking gave added confidence to continued occupancy of the tower, and also provided a timely cross-check and validation of design assumptions for The Majestic Centre upgrade. At completion of the seismic strengthening upgrade, 97% of the building’s net lettable area achieves a performance-rating equivalent to 100% of NBS. The upper part of the main entrance atrium is rated at 85% NBS. Two small tenancies outside the tower, comprising 3% of the net lettable area, are rated at 40% NBS and may be strengthened in future. The 100% NBS performance rating, provided by Holmes Consulting LP, has been based on a performance based assessment to ASCE-41 performance objectives at Life Safety and Collapse Prevention limit states for 100% and 150% earthquake load levels to NZS1170.5:2004 (New Zealand Loadings Standard) respectively.